Lacrosse is the oldest sport in North America with some saying it dates back to the 1400's. The sport was first developed by North American Indians who originally played it as a means to toughen braves for war or to settle disputes between tribes. 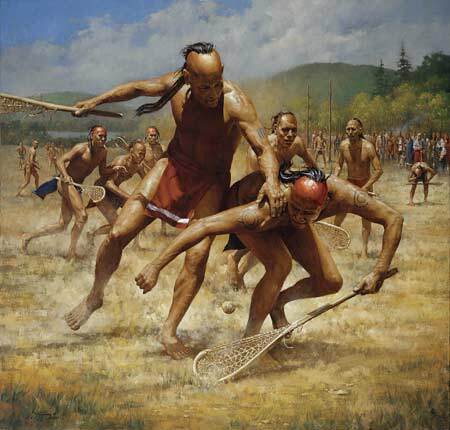 By some accounts the North American Indian game of lacrosse was often a vicious affair where serious injury was common place and participants would even be killed on occasion. The North American Indian game of lacrosse would have as few as 100 players and as many as 1,000, and would often last several days. With no out-of-bounds, the game field could cover miles and the goals, which were often trees or piles of rocks, would span anywhere from 500 feet to a mile apart and could also be several miles apart. Lacrosse remained an unknown sport until the 1600's, when a Jesuit missionary by the name of Jean de Brebeuf witnessed a game being played by the Huron Indians. When reporting what he observed to his superiors, Brebeuf likened the stick the Indians were playing with to the "crosier" carried by bishops during religious ceremonies, and from there, the name "la crosse" was created. In the early 1800's French settlers in Montreal took-up the game of lacrosse and the game started to become a more civilized and organized sport. A Canadian dentist standardized the game in 1867 by establishing limits on the number of players, field dimensions and rules of play. In 1877 New York University fielded the first college team in the nation and by 1882, the game was picked-up by several private high schools such as Philips Andover Academy in Massachusetts, Philips Exeter Academy in new Hampshire and the Lawrenceville School in new Jersey. The game received additional notoriety in 1956 when Jim Brown from Syracuse University scored six goals for the North in the North-South Lacrosse game. Brown later become one of the most accomplished running backs in the NFL and was heard to say that he preferred lacrosse over football. The NCAA eventually took over the reigns of college lacrosse and the first collegiate championship was held in 1971. Today, the sport continues to gain tremendous popularity throughout the country. While the traditional hotbeds of the sport are Long Island and Baltimore, lacrosse has spread like wildfire across the nation and is now played in almost every corner of the US.